From 2002 to 2013, the Spanish Archaeological Mission in Jordan realized a long-term excavation, restoration and musealization project, directed by Dr. Ignacio Arce. Included was the systematic collection of all the remaining inscribed stone blocks, that are a very special attraction at Qasr Al Hallabat. They contain a legal text related to the military organization of the eastern border of the Byzantine Empire, decreeded by imperial court at Constantinople in the reign of Emperor Anastasius I (491 - 518 AD). The Greek inscriptions of more than 300 lines and approximately 70 chapters, are engraved in 160 basalt blocks that were re-used in the masonry of later construction periods. A set of exact copies is displayed in a lapidarium at the site museum. Palace with a square floorplan and four towers, and a mosque nearby. Built on the site of a former Roman fort. 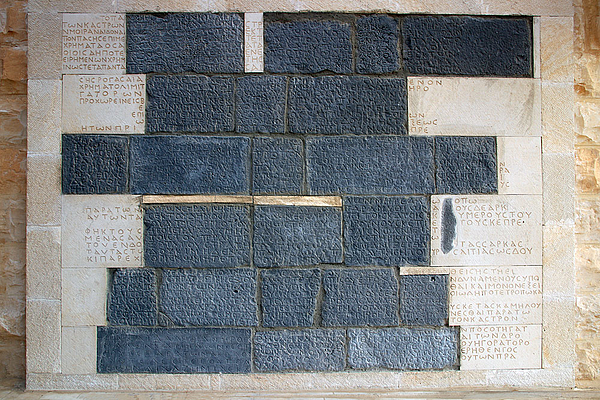 Greek inscriptions on 160 basalt blocks.